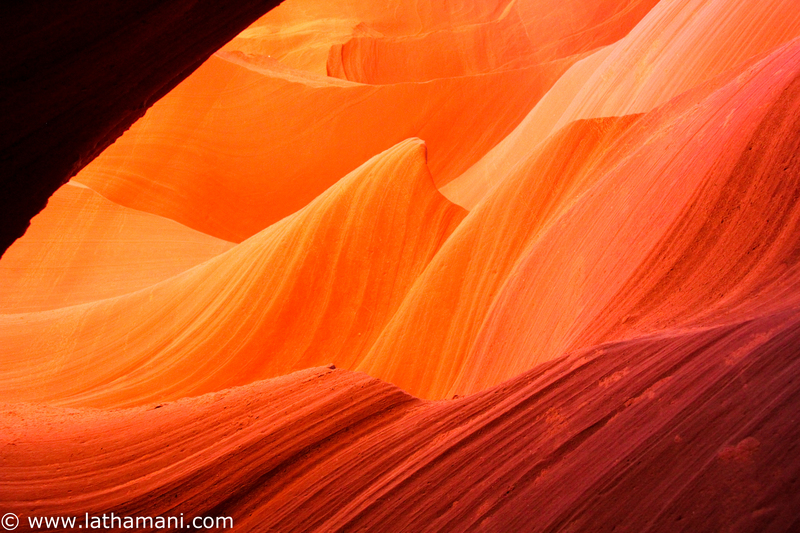 to visit this place and personally experience the surreal beauty of the Canyon. around Page and totally depends on your interest and available time that you have have on your trip. 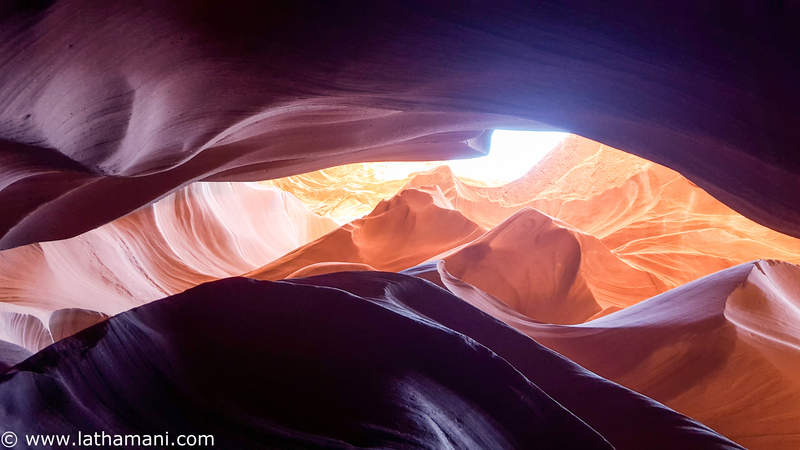 Upper and Lower Antelope Canyons are one of the most visited top destinations and has become a major landmark for photographers. 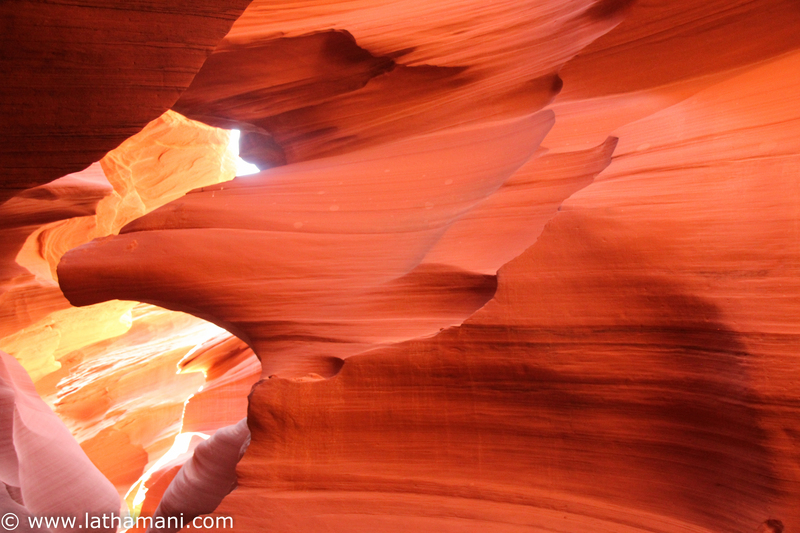 The Canyon’s beauty can well be described when the direct sunlight beams into the canyon’s open slot and you’ll appreciate the beautiful color combination happening at this place.It’s also advised to visit the canyon during noon time especially 12 PM – 1 PM to capture the excellent colors of the canyon. The sunlight creates that glowing magical effect for the photographers. 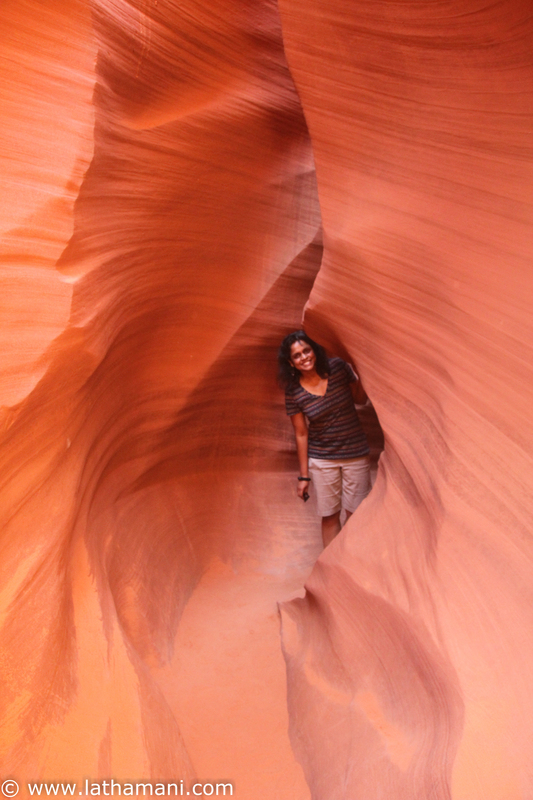 Many travelers have this question of which one is better to visit Upper Vs Lower canyon. In my opinion both are good and if you have time and money my recommendation would be to explore both the canyons.Both the canyons offer visitors vibrant colors when the sun shines overhead, producing contrasting textures and layers of sandstone.Tours and entrance are operated independently from the upper canyon.The canyon is located on private land and all tourists visiting either canyon are required to do so with an authorized guide.The local guides provide you really good insights about the canyon and will give you tips and pointers on the great picture perfect spots. Our guides in both Lower and Antelope were really so nice and we were able to take some excellent shots with the help of them. So what are the big differences between Upper and Lower ? 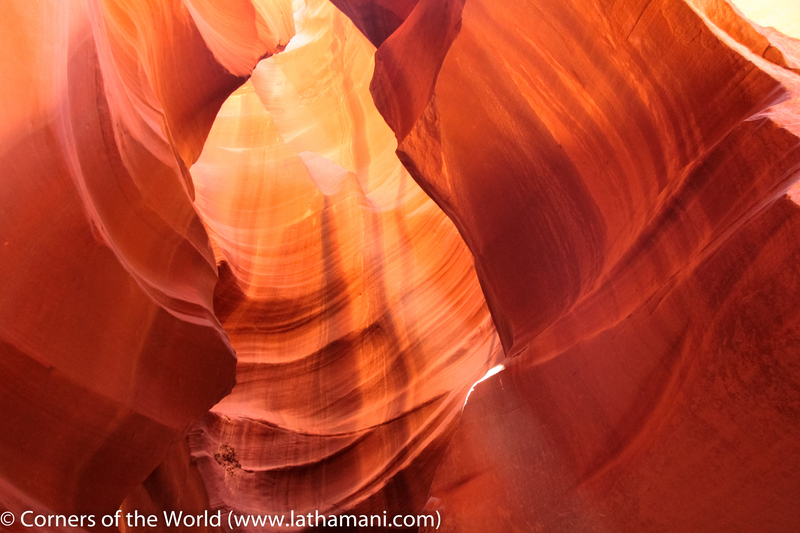 Lower Antelope Canyon is narrower, steeper, and has steps to climb up and down when compared to Upper Canyon. It is half mile long and 120 feet deep. The entry to Lower Antelope involves a very short hike and you will need to climb down the ladder to get into the Lower canyon.I have read in the travel forums that lower antelope is more physically demanding than Upper and is less crowded but in reality I did see equally good number of visitors to Lower Antelope. I would say if your family is not afraid of steep stairs and follow direction of the guide, anyone can attempt it. It’s definitely going to take a lot more physical effort than Upper but it’s totally worth it.I personally enjoyed every bit of the canyon and the photographs were equally good as Upper Antelope. 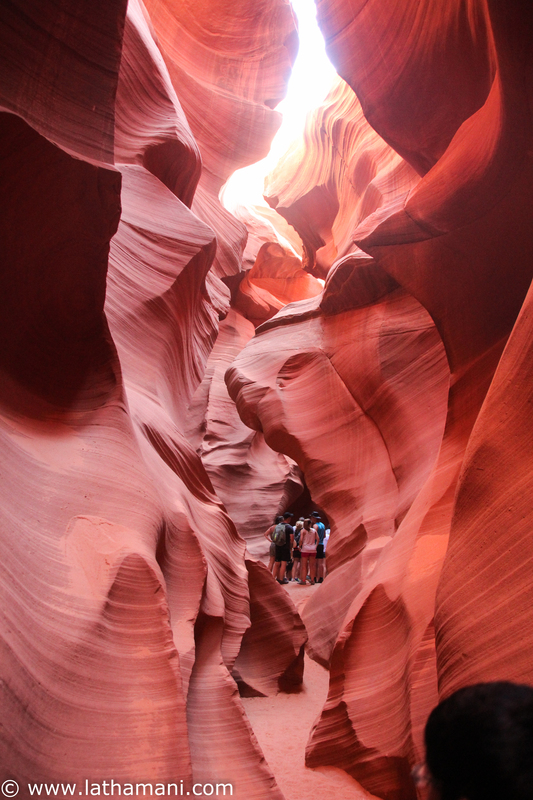 The Lower Antelope tour is an hour long and the fees are much less when compared to Upper. It’s only 20$ and you can directly take your car to the tour location.We took Ken’s tour and got the tickets directly at their location. No advance booking is necessary but go early to their location to purchase the tickets. It does get crowded and tour starts 10 AM that runs every hour and their last tour is at 4 PM. Upper Antelope is very flat and takes you right into the entrance from parking lot.It’s very famous for the strong beams of light the sun that is created mid-day. 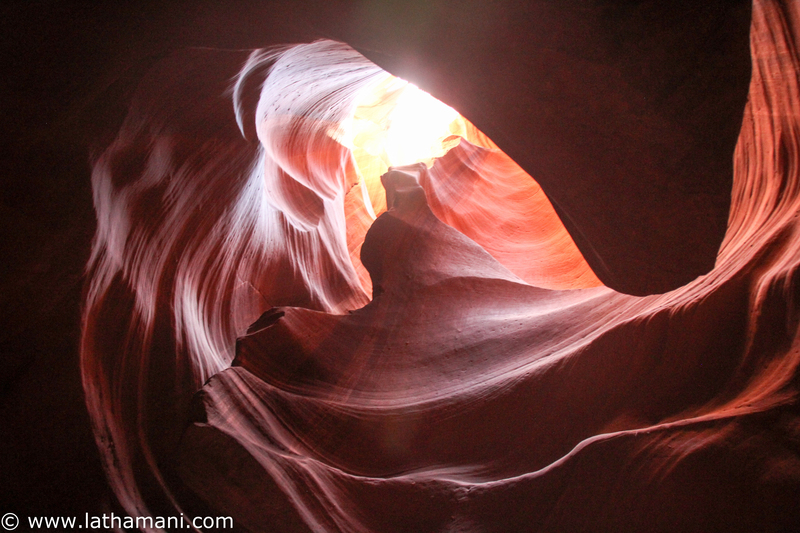 The only way to access Upper Antelope canyon is via the tour from Navajos. There are several tour companies within Page area and you will need to book the tours via them to access the Upper Canyon.The road to Upper canyon entrance is a very rugged road and is operated only by tour companies. It’s a 15 minute ride in one of their trucks and there’s lots of sand leading into the canyon entrance area.You will see several trucks waiting outside the canyon area packed with tourists. It’s a very popular destination and you’ll see groups of people everywhere especially at the peak time between 11 AM to 1 PM. One of the things that I personally didn’t like in Upper Antelope was the large number of people obstructing the views and we had to wait to take some very good pictures.The tour length is 1 hour 15 mins because of the extra ride to the canyon and the fees were much higher than lower Antelope. We paid close to 49$ per person that included cost of the round trip ride to and from the tour location. Kens tour is located approximately 2.5 miles east of Page, Arizona on HWY 98. You will see Upper Canyon entrance on Hwy 98 and lower canyon is just across.Turn left on Navajo Route N22B for about 0.25 mile and you can see the entrance sign on the left.